Purple variety of the mineral quartz, often forms large, six-sided crystals. Fine velvety-colored gems come from African and South American mines. In demand for jewelry at all price points. Amethyst was as expensive as ruby and emerald until the 19th Century, when Brazil’s large deposits were discovered. It was believed to prevent intoxication—amethystos means “not drunk” in ancient Greek. Today, as the most valued quartz variety, amethyst is in demand for designer pieces and mass-market jewelry alike, and its purple to pastel hues retain wide consumer appeal. The artist wrote that amethyst quickens intelligence and gets rid of evil thoughts. Single amethyst crystals can be huge: the GIA Museum displayed a doubly terminated crystal that weighed 164 pounds. Assessment of the following characteristics determines amethyst’s value. 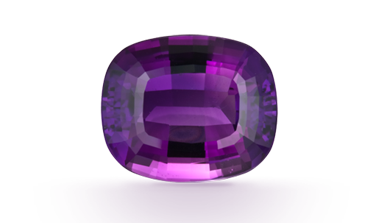 The finest amethyst color is strong reddish purple to purple with no visible color zoning. Most amethyst doesn’t have inclusions you can see without magnification. Amethyst is cut into a variety of standard calibrated shapes, including rounds and ovals. Amethyst is available in all size ranges for setting into a variety of jewelry styles.